The details never end when it comes to custom home building. Once you’ve selected your kitchen sink and countertop, you then have to decide on the sink reveal. A reveal refers to the amount of sink you see “revealed” under the counter. This only applies to undermount sinks, and there are three reveal options. 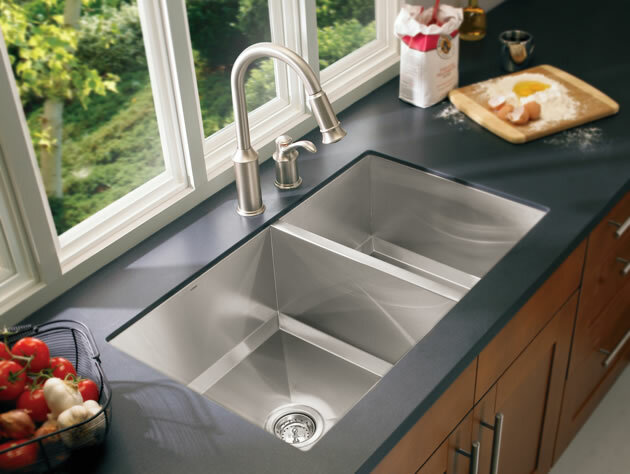 A positive sink reveal is when the countertop edge sits back from the edge of the sink. This exposes a small portion of the sink rim. The countertop sits about 1/8th of an inch from the sink edge. This type of reveal is easier for fabricators to cut, as there is some leeway in the cut. The downside of this type of reveal is that it can get grim or food build-up if not cleaned regularly. A negative sink reveal is when the countertop extends over the edge of the sink on all side. The countertop hangs over about 1/8th of an inch. This creates a more streamlined look as the sink edge is completely covered. It also is very easy for wiping crumbs into the sink. However, the countertop edge is more susceptible to chipping and may hide mold growing under the edge. A zero reveal sink, also known as a flush mount, is when the countertop is flush with the inside of the sink. There is no reveal either on the top or bottom. The edges of the countertop and the sink are perfectly aligned. This requires very precise fabricating and skill during installation, which means it typically costs more. However, it is the easiest sink reveal type for cleaning. When it comes to undermount sink reveals, there are pros and cons to each of them. Either way, it will turn out beautiful! Undermount sinks are what we most recommend for kitchen designs in our custom homes due to their streamline look and how easy it makes cleaning. If you have any questions or want to get started building your dream custom home contact us today!